Innovative rainwater catchment and treatment system makes Heron Hall first residence in state, fourth in world to achieve Challenge's water imperative. This is more than just a home for Jason and his family. This is yet another story showcasing how Living Buildings are creating resiliency at all scales. In September, Heron Hall, the residence of McLennan Design’s CEO, Jason F. McLennan, became the 100th project worldwide to achieve certification through the International Living Future Institute’s (ILFI) Living Building Challenge - the world’s most rigorous and progressive green building rating system. The Challenge, authored by McLennan prior to him founding the ILFI, is a holistic framework consisting of seven organizing requirement categories: Place, Beauty, Energy, Materials, Health + Happiness, Water and Equity. For Heron Hall’s initial petal certification, Place, Water and Beauty petals were targeted. 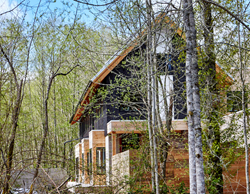 The McLennan Design team plans to obtain the remaining four petals over the course of the following year, resulting in full LBC certification for the Bainbridge Island residence. The home is the fourth single family residence in the world to achieve the Water Petal and the first in the state. The LBC’s place petal focuses on ecological restoration and curbing urban sprawl. Projects meeting the place petal intent engage relationally with their setting integrating restoration projects as necessary to regenerative ends. Likewise, the Beauty petal seeks to contribute to a sense of place through its inclusion of culture and place specific elements integrated throughout the project solely for the delight and wonder of occupants. The water imperative requires a project meet all water demands within the carrying capacity of the site, collecting, using, reusing and releasing rainwater onsite in a way that mimics natural hydrological systems. Heron Hall’s certification as the 100th LBC project is poetic and symbolic for McLennan. “When I first wrote this standard, I was told I would be lucky if one project ever got certified,” says McLennan. “Being the 100th in the certification’s first ten years is a great feeling.” McLennan left ILFI in 2015 to launch McLennan Design, inspired to put the LBC standard to practice. Heron Hall is just one of several McLennan Design LBC projects currently underway in a field of over 500 registered projects.